Bhutan, also known locally as Drukyul (Land of Thunder Dragon), is one the most exotic destinations we offer. Located to the North of India and South of Tibet, it is the last surviving Mahayana Buddhist Kingdom, with a breathtaking Himalayan landscape as a backdrop. 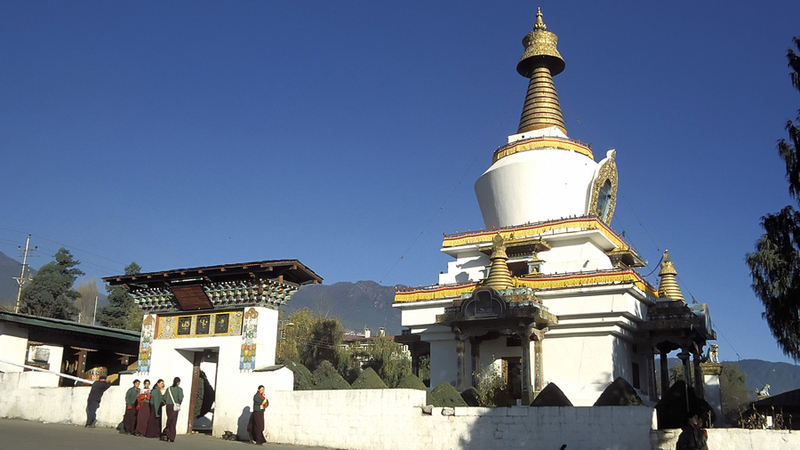 The country was never colonized, and thus survived the influences of accelerated and thoughtless modernization; which makes our Bhutan tours some of the rarest and most unique travel destinations. With population of little more than 600,000, you will experience a very different lifestyle to the world that we live in. Bhutan has maintained a very traditional culture, yet has adapted what it needs from the modern world. Thus you will find monks saving their text in a computer and traditionally dressed archers using the most modern high-tech bows and arrows in their archery tournament. The size of Switzerland, it is a country of rolling hills and towering crags, with only small patches of cultivation and very little deforestation, rich in flora and fauna. Be among the few lucky ones to visit the pristine and nature loving Kingdom of Bhutan on one of our Bhutan tours.